ASHBURN, Va. – It seems there’s always a data center rising over an open field in Data Center Alley. But the new QTS Data Centers facility is rising higher than most. It will be the first three-story data center here in Ashburn, the cloud computing hub in Northern Virginia. It’s the latest sign of how data center developers are building now building multi-story data centers, boosting their capacity to house IT gear by adding vertical space. 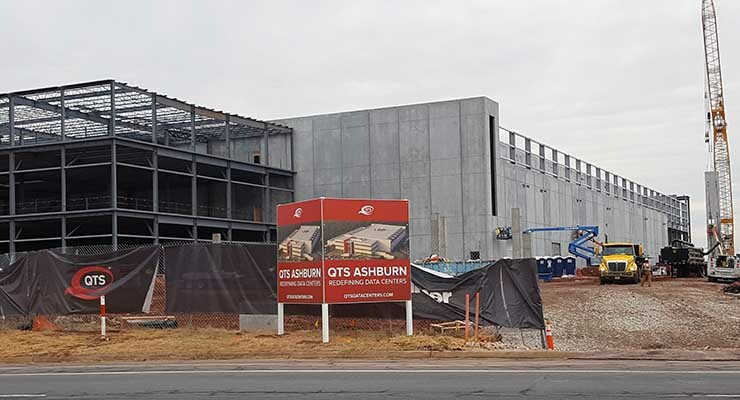 Digital Realty, Equinix and RagingWire Data Centers are among those that have recently built two-story data centers in Ashburn, while CoreSite is building four- and five-story sites in nearby Reston. The height of the building isn’t the only new wrinkle in the QTS Ashburn project. As it sharpens its focus on hyperscale data centers, QTS is also changing the way it creates its facilities, pursuing “greenfield” construction on open land rather than retrofitting an existing building. In 2016, we noted that “QTS Realty has become the master of the Internet-scale retrofit, finding former industrial facilities with sturdy infrastructure and transforming them into massive data centers.” The company has an enviable track record in buying infrastructure-rich properties at discount prices, and transforming them into digital data fortresses. The company’s entry into the Ashburn market kicks off a strategic shift in which QTS is buying land in the data center markets that are most attractive to companies deploying hyperscale cloud infrastructure. QTS acquired 53 acres on two parcels in Ashburn, as well as an 84-acre property in Phoenix and 92 acres in Hillsboro, Oregon, a data center hub just outside Portland. Greason is well aware of QTS’ reputation for being opportunistic in its development, retrofitting large former semiconductor fabs near Dallas, while rehabbing an old newspaper printing press in Chicago. Perhaps the best example is the QTS Richmond campus, another former semiconductor fab where it has prototyped its hyperscale designs. But Greason says the shift at QTS is about more than construction methodology. QTS has been distinctive for its “three Cs” product offerings featuring custom data centers, colocation and cloud. The size of its data center buildings allow QTS to create custom data centers within the footprint of a larger facility. 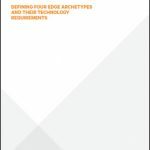 In recent years the growth of cloud computing has super-sized the requirements for hyperscale customers, which now range from 5 megawatts to as much as 35 megawatts of space in major markets. Competing for those deals requires flexibility with capacity and delivery timelines. “In 2018 we’ll be very intentional about hyperscale,” said Greason. “The transition from opportunistic to intentional is a new approach. The new building is not the first for QTS in Ashburn. It operates The Vault, a nearby data center for high-security tenants that QTS acquired when it bought Carpathia Hosting in 2015. But the company took things to the next level in October, acquiring 52 acres across two parcels of land, where it plans to build 700,000 square feet of data center space and 140 megawatts of IT capacity. The initial greenfield build here is on a 24-acre site where QTS is bulding a 32 megawatt data center. The company will build out the entire structure as powered shell, and then complete the 4-megawatt first phase. QTS said it has pre-leased 2.2 megawatts of the first phase to a global health insurance provider. Each of the three floors will feature 22,000 square feet of office space at the front of the building, along with four data halls. The evaporative cooling infrastructure will reside on the south side of the building, as will a row of emergency backup generators. QTS expects to operate the facility at a design PUE of 1.18. The QTS property has enough land to accommodate a second structure housing up to 16 megawatts of critical load. The site is supported by a 50 megawatt substation, which can be expanded to 100 megawatts. The company has also acquired a 28-acre parcel in Ashburn to provide additional runway for future expansion. During a recent site visit, Greason gave Data Center Frontier an overview of the project and the company’s plans in Ashburn. QTS said it expects to finish the first data hall in April and complete commissioning by May. As it competes for hyperscale customers, commissioning and data hall preparation is an area where QTS believes it can speed customer deployments. “It takes six weeks to commission a data center,” said Greason, who said QTS has begun providing customers with access to data halls so they can begin their rack-and-stack even while the hall is being commissioned. That involves coordinating schedules with customers, construction crews and commissioning teams to define times when customers are allowed in the space, and when it is closed for commissioning work. QTS maintains a Hyperscale Acceleration Team to continuously seek ways to streamline the deployment timeline. With growing hyperscale capabilities in multiple markets, QTS is embracing “revenue portability” – the ability for customers to shift contracted capacity between geographic markets. “We see the willingness to be flexible as a competitive differentiator,” said Greason. 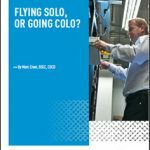 The focus on hyperscale leasing has been disruptive for the data center industry, prompting changes in the supply chain and the design of data halls. Another change has been increased collaboration with customers to understand their capacity needs and timelines, and work together to meet them. Greason says this is good for the industry, noting that 60 percent of new business at QTS comes from its existing customers.